The main problem with electronically stored data is that our computers don’t have enough storage and processing space. For instance, a medium-sized company may get to have up to 500GB of data in a very short period of time and as the amount gets bigger, the processing power gets weaker. After all, have you tried to perform a search in 500GB of data with a regular computer? It’s absolutely ludicrous! Increased internet usage which can often be costly. Especially for laptops working off 4G mobile broadband. A few gigabytes sync can cost hundreds of dollars. Businesses that don’t use a file sync-and-share tool like Google Drive Sync or Dropbox often use a VPN (Virtual Private Network) for remote access. However, a common problem with VPN’s is the speed. It is slow and employees try to avoid it because of this. So a sync app or a VPN solution may be the main culprit in making your device move slowly, dragging its feet through the entire work process. Here is where Drive File Stream comes up! While it’s not released yet, it promises to bring the power of streaming to your company, which is quite an impressive feature. Drive File Stream is a game changer when it comes to businesses who can’t operate fully in the cloud. It actually is superior to any file sync and share tool or VPN solution. Even more, you will never run out of storage space in the cloud or on your device. This is because G Suite Business has unlimited storage in the cloud and File Stream uses up almost no hard drive space since only the main folder and file locations are synced to your device and not the actual data. The data is streamed to your device only when you open the file and not a second earlier. How Does File Stream Work? The File Stream solves the issue of slow devices choked by huge amounts of data. The files are streamed in real-time to your computer so the actual space they take is minimal. This frees your processing power and removes the syncing issues allowing you access to any amount of data, anywhere. 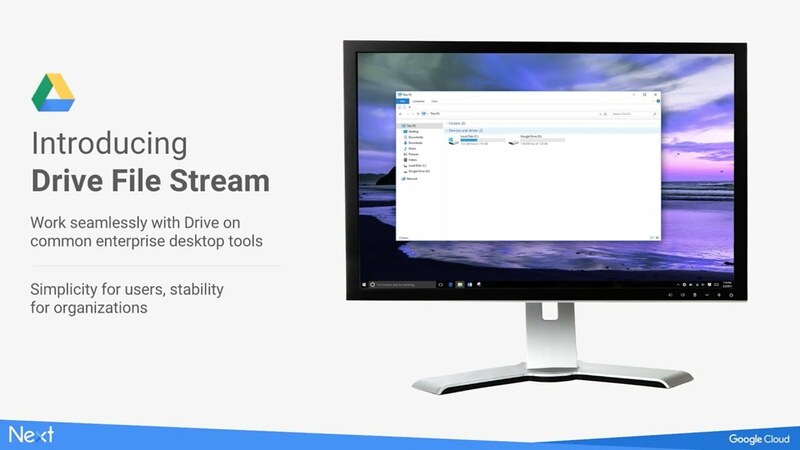 Google will make File Stream available as an app that works on both Windows and Apple devices. Even more, the app works perfectly with all the other Google apps you’re regularly using. It is also great if you’re still using desktop applications like Microsoft Office, CAD software, MYOB, etc. You might also wonder about streaming speed – after all, it would be of no help to you if your files are kept in loading forever. Well, the team working on File Stream made sure the stream is fast regardless of the activities you’re performing (navigation, search, editing docs). As an example, the average first sync (immediately after installation) is 23 seconds and after this, there won’t be any delays in streaming files to your device. And finally, one other major benefit is data protection. IT professionals are always trying to find new ways to protect company data, but with File Stream, you don’t have to worry anymore. Because all the files are on Cloud, if a device gets stolen, the data is safe since it’s not on the actual device. Also, File Stream works best when it is setup with Team Drives, since it will help you simplify the rights assignation process (data the staff should have access to in the business). To learn more about Team Drives, take a look at our article here. Well, since we’re not living in a perfect world where WiFi is available everywhere in high-quality, there will be situations when you need to access files when you’re offline. File Stream offers this possibility by simply selecting the ‘Make available offline’ option for the files you need. This means those files will be downloaded on your computer and kept in sync mode. Drive File Stream is due for launch on September 26 2017 and will be available for basic and business licences. The File Stream app will need to be installed on each computer in your company, this is why it’s a good idea to have a G Suite Certified specialist help you implement this solution. Onsite Helper’s engineers are G Suite Certified and happy to assist with your requests!